The beauty of French doors is the way theybring the outdoors indoors. Another way to enjoy garden outlooks and let maximum light into your rooms. 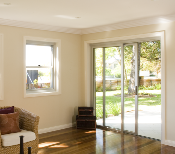 Sliding doors will open your home up to glorious light and extend living areas to the outside. Removes the barriers to allow flow between indoor and outdoor living. Windows are the eyes of your home, They allow you to see beyond the walls within which you live. Windows are a true reflection of your homes character. Windows break down the barriers of plain boring walls to allow the fantastic and ever-changing sun and moon light enter your home. Windows create rooms that are light, inviting and constantly changing. The more natural light we can bring into a home the more life and atmosphere it will have. No window does it more elegantly and gracefully.